Memphis Depay and Virgil van Dijk. One of these players features on our list of great Dutch Premier League players. But which one...? 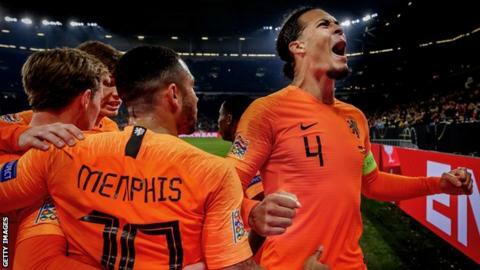 It has been quite a season for Dutch football - the national team are into the Nations League finals, their captain Virgil van Dijk is at the heart of Liverpool's title bid and Ajax reached the Champions League knockout stages for the first time in 13 years. Van Dijk has been speaking to the BBC Premier League Show, which returns on Thursday at 19:00 GMT on BBC Two, and it got us thinking about Dutch legends. We have picked who we think are the 12 best Netherlands stars to play in the Premier League. Read about them and then vote for which one you think is best at the bottom of this page. Tremendously talented forward Bergkamp was named Arsenal's second greatest ever player in 2017, just behind strike partner Thierry Henry. In 11 years at Arsenal, Bergkamp won two Premier League and FA Cup Doubles as well as a third league title in the 'Invincibles' season and another two FA Cups. He scored 107 goals in 400 appearances. His goal against Newcastle in 2002, where he turned Nikos Dabizas and slotted the ball past goalkeeper Shay Given, was voted the best goal in Premier League history by BBC readers in 2017. Technical genius Gullit, who could play almost anywhere on the pitch, started his time at Chelsea in 1995 as a sweeper before moving into midfield. He scored five goals in 50 appearances. He went on to be player-manager at Stamford Bridge for more than 18 months, leading the Blues to the 1997 FA Cup - their first major trophy in 26 years. One of the Premier League's great finishers, Hasselbaink spent almost a decade in British football - one season at Atletico Madrid aside. He shared the 1998-99 Premier League Golden Boot while at Leeds before winning it outright in at Chelsea 2001-02. Despite scoring 127 Premier League goals - he is 13th on the all-time list - he never won a major trophy in Britain, losing FA Cup finals with Chelsea and Cardiff and the 2006 Uefa Cup final with Middlesbrough. A cult hero at Anfield, Kuyt was signed as a striker but was turned into a hard-working right winger by Rafael Benitez. He managed 71 goals in 285 games for Liverpool, including in their 2006-07 Champions League final defeat by AC Milan, 2011-12 League Cup final victory over Cardiff and a famous Premier League hat-trick against Manchester United. Still one of the best wingers the Premier League has seen, speedy Overmars helped Arsenal to win the league and FA Cup Double in 1997-98 in his first season, including a goal in the cup final against Newcastle. He scored 41 goals in 142 appearances before leaving for Barcelona for £25m. Robben remains one of the top wide players in Premier League history despite three injury-hit seasons at Chelsea. In his first campaign he helped the Blues to a first league title for 50 years under Jose Mourinho, as part of a devastating front three alongside Damien Duff and Didier Drogba. He also won a second league title a season later, the FA Cup in his final year and two League Cups, before moving to Real Madrid. He scored 19 goals in 106 games for the Blues. A brilliant centre-back, Stam was also quick with good ability on the ball. He won the Premier League in each of his three seasons with Manchester United, including the 1998-99 league, FA Cup and Champions League Treble. After 127 appearances - and one goal - he was sold to Lazio following a falling-out with United boss Sir Alex Ferguson, a move the Scot later described as a mistake. After four good seasons at Fulham, Van der Sar joined Manchester United in the summer of 2005 and finally helped them fill the void left by the legendary Peter Schmeichel. Van der Sar won four Premier League titles in six seasons with United, and was man of the match in the 2008 Champions League final as they beat Chelsea on penalties. His final game before retiring was the 2011 Champions League final, which United lost to Barcelona. Playmaker Van der Vaart joined Spurs from Real Madrid in 2010, having to make a "split-second" decision about the move following a late bid before the transfer deadline. He enjoyed some wonderful performances and goals at Spurs, netting 28 times in 77 games, including four in as many north London derbies against Arsenal. He left for Hamburg after only two seasons when Gylfi Sigurdsson took his place in the team, a transfer Van der Vaart later said was a mistake. Van Dijk is currently trying to lead Liverpool to their first Premier League title. A talented footballer as well as a leader at the back, he has helped give the Reds a solid backbone since joining from Southampton in what remains a world record £75m fee for a defender. The former Celtic player has scored 11 goals in 136 appearances for the Saints and Reds. Devastatingly prolific, Van Nistelrooy managed 150 goals in 219 appearances across five seasons at Manchester United. He won one Premier League title, one FA Cup and a League Cup during his time in England. He also won the 2002-03 Golden Boot with 25 goals. Van Nistelrooy left United for Real Madrid in 2006. Despite spending 11 seasons in the Premier League, Van Persie managed only one Premier League title with Manchester United and an FA Cup with Arsenal. Van Persie scored 132 goals for Arsenal in eight seasons, finishing off with a Golden Boot before a controversial move to United. He retained his Golden Boot in his first season at United as they won the league title in Sir Alex Ferguson's last season in charge. His goals at Old Trafford took his Premier League total to 144, making him the highest-scoring Dutchman in the competition. The winner of the vote will be revealed on the Premier League Show on BBC Two at 19:00 GMT on Thursday, 7 March.